This week we arrive at the last of the five basic elements with three poses for the element ether, or space. The lightest, most subtle element, ether is the container for everything in manifested reality — everything happens within ether and it is the space between every atom. The element space is described as ethereal, light, airy, and spiritual, and is associated with conscious awareness, resonating with your inner truth. Within the body ether feels like stillness, emptiness, freedom, and expansion. Representing the fifth, or throat, chakra, the ether element relates to self-expression, acceptance, communication, sound, vibration and speaking one's truth, and is concentrated in the area of the throat. Lion’s Breath is a fantastic way to stretch the muscles of your jaw and face, creating space around the throat and head. From all fours (hands and knees), bring your legs together and sit back on your heels, placing your hands on your knees. Take a large inhale and on your exhale, open your mouth super wide and stick your tongue way out while widening your eyes. Try it two or three times and then rest quietly on your heels and notice the slight buzz through your face. Take a few deeper breaths connecting to the space you feel around your neck and head. Lie flat on your mat with your feet hips distance apart and directly under your knees. Slowly lift your hips off the floor into a Bridge Pose and slide one or two blocks underneath your sacrum, low toward your tailbone. Turn your outer arms down toward the floor and wrap your shoulder blades under your upper back. Widen your collarbones back and lift your chin slightly, opening your throat. If you feel stable, bend one knee at a time toward your chest and take both legs up in the air. Keeping your shoulder blades wrapped under, take five to six breaths. 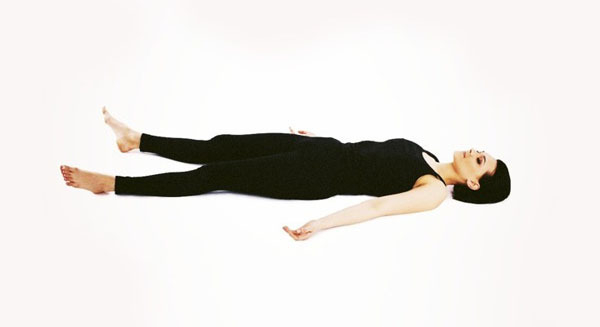 Savasana is the ultimate pose for experiencing the stillness and spaciousness of the element ether. Next time you’re in Savasana, allow the back of your body to relax more deeply into the floor and concentrate on softening your skin, allowing the boundaries of your body to blur with the space around you. Now that we’ve explored all five basic elements through yoga poses, which element was your favorite to play with?